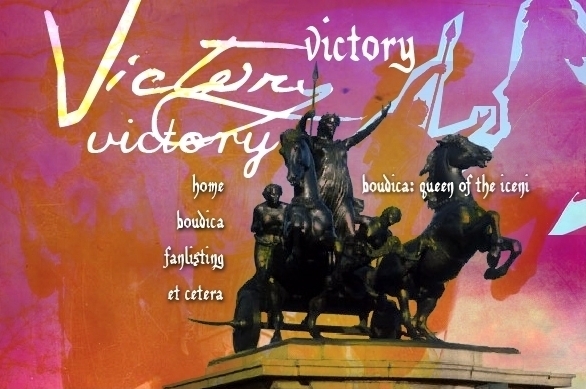 You have reached the Fanlisting Network approved fanlisting for the legendary warrior queen of the Iceni: the wonderfully fierce Boudica. This ancient military maverick sacked great cities and crushed many Romans, causing much embarrassment to the world's greatest empire. To learn more about Boudica's story, visit the Boudica section. If you are already informed and just want to join, head to the join page. And if you are not familiar with the concept of a fanlisting, it is simply a listing of fans of a certain subject around the world, whether it be an actor, place, object, or idea. To learn more about fanlistings, click here. Victory! was opened by Connie on July 17, 2006, and adopted (read more) by me, Tehomet on the 9th of August 2007.